On Sunday – Carnivorous Fiancé’s actual birthday – a second request was made, this time for barbecued T-Bone steak with homemade garlic and rosemary fries. I wanted to bake something for after, celebratory enough for a birthday but light enough to enjoy after such a carnivorous main. I’ve had a jar of pistachio cream sitting in the cupboard for weeks while I dreamt about what to do with it. Made with pistachios grown at the foot of Mount Etna and the preferred brand of Pierre Hermé himself, this stuff is pretty special (read expensive), and while macarons, ice cream or simply spooning it out of the jar were all options which appealed, I’m glad I ended up saving it for this occasion. Éclairs are often filled with crème patissière, but here I’ve used a simple mixture of pistachio paste and cream. The paste is ever so slightly sweet and nutty, and the clouds of green cream contrast wonderfully with crisp pastry and glossy chocolate ganache. Toasted pistachios add texture to the top and each bite is a crispy, creamy, chocolaty, nutty delight. This isn’t a post about cake. But it’s a very tasty alternative and I’m pretty sure the combination of butterscotch and bourbon will be making another appearance soon. It looks like a lot of steps below but please don’t let that put you off. I made these éclairs in less than an hour, glazing them while on the phone to my Mum: once the choux pastry is made, it’s little more than an assembly job. Transfer the choux paste into a piping bag fitted with a large plain nozzle and pipe strips direct onto your baking parchment. To stop the paper moving around, dot a little choux paste under each corner and make sure you leave a little space between each line as they will puff up in the oven. Bake for 20 minutes then without opening the oven door (you want to keep all the heat in), reduce the oven temperature to 180 degrees C and bake for a further 15 – 20 minutes until completely dry and crisp. Remove from the oven, pierce a hole in the bottom of each one with a skewer to let any steam out and set aside while you make the cream and glaze (below). Whip the cream until stiff peaks form. Fold in the pistachio paste using a large metal spoon then transfer to a piping bag fitted with a plain nozzle. Place the chocolate in a heatproof bowl. Bring the cream to a simmer then remove from the heat and whisk in the glucose syrup. Pour the cream mixture over the chocolate and leave to stand for 2 minutes. Using a spatula, gently stir the chocolate until the mixture is glossy and smooth. Using a sharp knife, split each éclair horizontally. Pipe the pistachio cream to fill the empty bottom half of each éclair then replace the top halves. 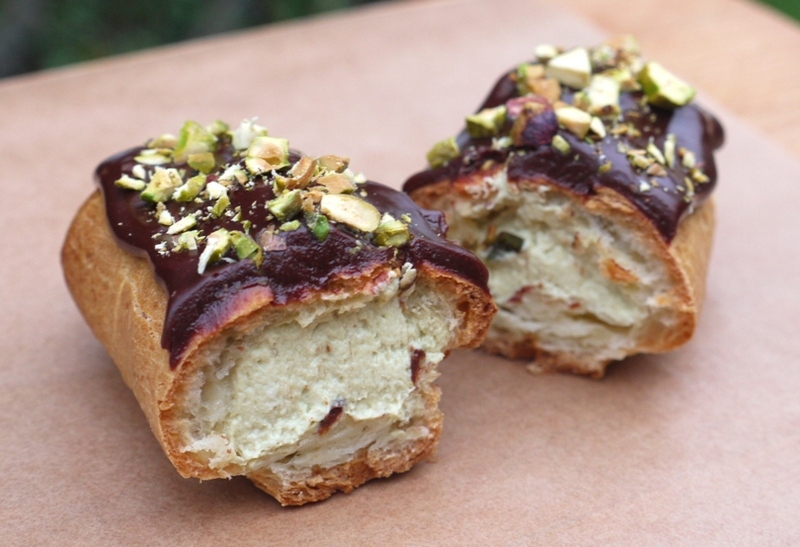 Glaze the éclairs with the ganache – I used a teaspoon although I’ve also seen people dip or use their finger to spread it across – then sprinkle with the toasted pistachios. 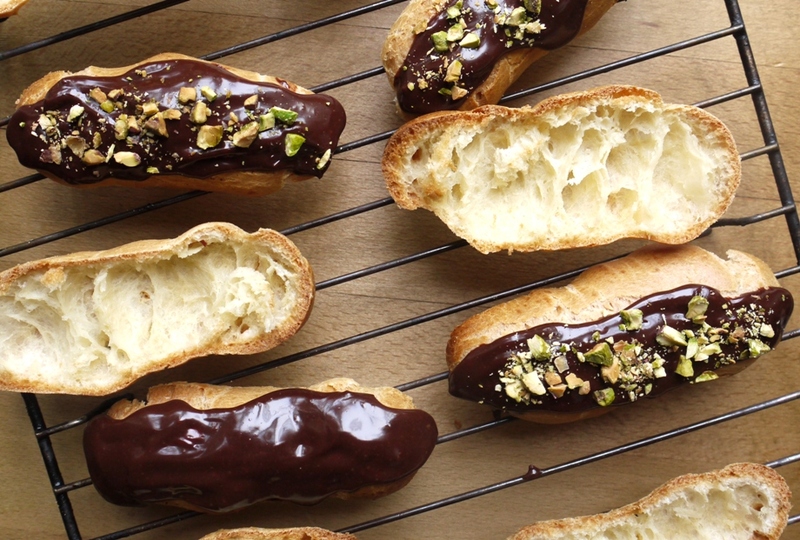 Eat within a few hours of filling for crisp, delicious éclairs. happy birthday to the Carnivorous Fiancé! how lucky of him to have all his requests fulfilled! the eclairs look yummy! These look absolutely brilliant. I love sll things pistachio so this is right up my alley. Will definitely put eclairs on my ever-expanding list of things to bake, it’s been too long since I last made them! I can’t tell you how much I LOVE these. What a good idea to use the pistachio paste, and hang the expense! We sometimes fantasise about buying a pistachio plantation on the slopes of Etna. Once you’ve tasted Bronte pistachios all others seem pale by comparison. But they are hard to find in this country and very expensive… But worth it! I’ve been meaning to make éclairs for a while now but never quite got round to it but these gorgeous beauties have convinced me that I need to rectify that! Such a lovely flavour combination and they look just perfect. Happy belated birthday to Carnivorous Fiancé! These are just the best Eclairs that I have ever seen. Pistachio cream is new to me, but not for long. Excellent. Oh my word these look wonderful! Certainly going on my to-bake list for 2013! Sophia – I know, I can’t believe how long it is since I last made them either! Tracey – they sound fascinating, would love to try a lavender eclair. Kathryn – thank you! 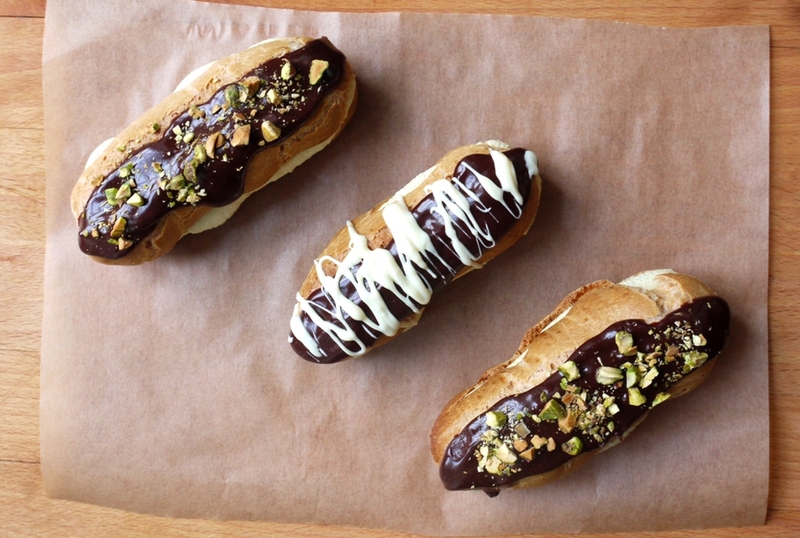 Do have a go at eclairs soon – they’re so delicious and pretty easy to make/adapt flavours to what you like. Food, Photography & France – its heavenly, highly recommend buying some to sample. wow, they look so yummy! My aunt makes éclairs almost every month, and I’ve always been a little intimidated by her and her éclairs. But I’m surely going to make some for valentine’s day, they look soo cute!! You said that you can fill them with something else, but I just got obsessed with the idea of pistachios… can that pistachio paste be made at home? Or is that kind of paste that can only be bought? Hi Sara. Yes, you can make it at home as I made it last year for ice cream. Method from The River Cafe cook book. It’s delicious! Roast 100g pistachios on baking sheet for about 10 minutes. Tip into a bowl to cool down a little, then put them in a mini food processor* (the type that comes with a hand blender or a separate mini chopper) with 40g caster sugar and blitz to a paste. This will take up to around 10 minutes. At first it will just seem dry, but keep going until it turns to a moist, dark brown smooth paste. I guess you would just double the amount for this recipe. Enjoy if you try it! I hope I’ll make those soon so I can tell you how yummy they were. Thanks for the tip Amy! As long as you make sure to add a little sugar then homemade pistachio paste would be a perfect substitute! Eclairs and profiteroles are my new love. These look superb and I love the sound of the pistachio cream. I’ve never been a fan of eclairs because I don’t like whipped cream. But pistachio cream sounds amazing! I’ve never tried it but these look fantastic and delicious. Brilliant spin on a classic – great find. These look quite frankly sinful! I love the flavour combination! Although I do definitely want to see more about this butterscotch and bourbon combo! These look lovely! I’ve never heard of pistachio cream before. I’ll definitely have to try it. I am looking forward to reading about the butterscotch bourbon cake … hopefully soon! Wow! These eclairs look very special. I love the colour contrast of the chopped pistachios on top of the chocolate. Gorgeous! What a great recipe and another chance for me to try out homemade pistachio paste that I used last year for ice cream (method above for Sara) when I didn’t feel I could justify the cost of the paste. I still think I may treat myself one day though, on your recommendation. Butterscotch Bourbon cake sounds good too. Lucky Carniverous Fiancé! Jules – it’s yummy, do give it a go. Tramp Student – thank you! Nelly – I promise to post something butterscotch bourbon-esque soon! Stephanie – as above, soon, I promise! Nickki – thank you! I love sprinkling pistachios on chocolate – the contrast is so pretty. Amy – thanks for posting the pistachio paste recipe, must try! A belated happy birthday to your fiancé! Everything you made for him sounds divine, and well, these eclairs look amazing. I saw an cookbook dedicated to eclairs the other day. 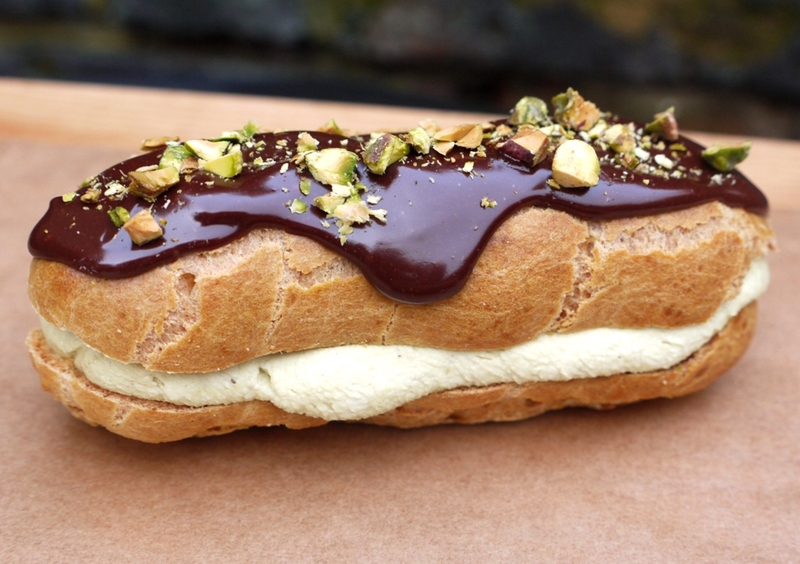 Do you think 2013 will be the year of the eclair? Gorgeous! Does the liquid glucose keep the ganache smooth and shiny? Beautiful! I’ve been psyching myself up to do more eclairs soon and you’ve motivated me! Jennifer – I’ve heard it may well be! And I’d take an eclair over macarons any day. Susan – it does indeed! The Bubbly Baker – thank you and so glad you like them! Aw, thank you. So pleased you’ve been reading the blog and thanks for a lovely comment! I’m currently working at a bakery and there are so many delicious cakes every day. But it inspires me to try and give them a go. Erin – thank you so much and Happy New Year to you too! Clare – that sounds amazing – very jealous! Humina, humina, humina! I have never wanted an eclair so much in my life! I adore pistachios and it’s a perfect nut with all of that pate a choux, creamy, chocolate goodness! Like I always say..I wish you lived in the US..near me!! Hope your New Years Eve was amazing and again, looking forward to all of your fgoodies in 2013..and these eclairs are already on my 2013 favorite list! Wishing your fiancé a very Happy Birthday! 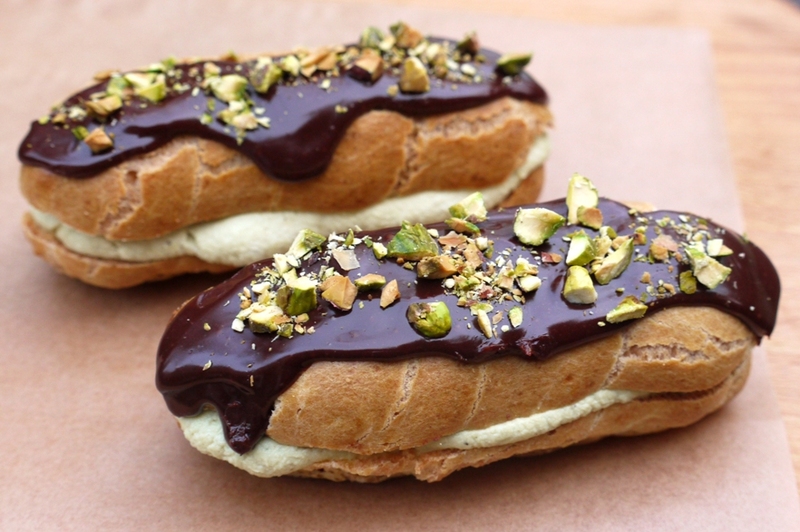 Those eclairs sounds outrageously good, pistachio paste is divine. Oh boy, loaf. Why must our tastes be so alike? Because you make me want to eat my computer screen and that certainly isn’t healthy ;). What an exquisite filling! Perfect celebratory eclairs!!! Sylvie – thank you, Happy New Year to you too! Jen – ah, thank you, so glad you’ve found it too! I’ve been meaning to get back to éclairs and now yours have inspired. I love the sound of that filling and maybe I’ll do one similar! Beautiful! Happy belated birthday! What a treat (or treats if I include the cake)! Jamie – if you haven’t tried that pistachio paste, please do, it’s utterly divine! Fudging Ahead – it was pretty gorgeous! 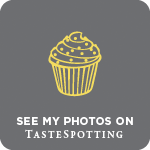 These look divine….great combination – beautiful photos. These are perfect. I made baked donuts today, but I think I really wanted to make something like these perfect little decadent desserts!